All transactions are safe and secure with a reliable history in online purchasing behind each of our associates. 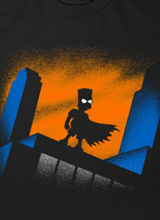 Buy the Bartman Simpsons t-shirt to own Simpsons clothing and merchandise. Do the Bartman in this Simpsons t-shirt that features Springfield's most rebellious superhero on the front. The design was inspired by the music video and the corresponding album The Simpsons Sing the Blues. Turn back the clock to the early 1990s and wear this T to teach your friends how to do the Bartman. In addition to the Bartman Simpsons tee above, browse the Simpsons Clothing Gallery for more apparel like men's and women's clothes, kids shirts or hoodies.